Just about everyone has an “About Us” section on their site. We prefer an “About You” page. As an Architect, you need to achieve a vision within the confines of a budget, life cycle and sustainability requirements. And as a Contractor, you need to complete your scope with minimal hassle. Does it really matter when we were founded, who our President is, or what equipment we use? Here is what might matter to you. At Protean, we are passionate about helping make great buildings that last. Protean has been providing project specific solutions with fabricated architectural cladding and accents since 1989. We are the industry leader in honeycomb core laminated panels and provide the widest range of solutions in the metal cladding market. Most “About Us” pages say the company is dedicated to quality, on time delivery and the lowest possible or “fair” price. Our “About You” page provides assurances and speaks to your needs. When you specify Protean as the basis of design in your project, you get an unparalleled 5 Year Workmanship and 20 Year Finish Warranty. We provide assurances of quality, not empty promises. If you want buildings that last, especially in the educational, civic, transportation and public projects, you can count on Protean. We focus on the close out date for your project. Delivery based upon standard lead times does not help you very much if you are on a restricted schedule. So if being “on time” to our standard lead time does not meet your needs, we will try to figure it out. Your total project costs are more important than the fair or “lowest possible price”. Our Estimators and Project Managers are experienced and knowledgeable. We make sure you are covered and there are few surprises. 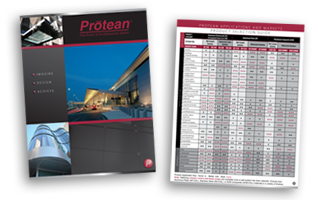 Protean will not always be the lowest price you see on a bid, but when the project is done, we will help you have the lowest cost. Is the leading provider of aluminum honeycomb and custom metal insulated panels (IMPs). See laminated panels. Has a deep history in the most complex aluminum plate panel systems. See plate panels. Offers robustly engineered aluminum composite panels for longer life. See ACM panels. Provides architectural column covers designed to match the metal wall panels. See column covers and wraps. Our laminated wall panels, laminated cladding systems, aluminum plate systems and aluminum composite (ACM) systems are all available in barrier wall systems or rain screen systems. And each of our systems is available as stainless steel cladding and can be fabricated from other metals or perforated metal for your cladding system. Click the image above to view or download a PDF of our brochure and product grid.